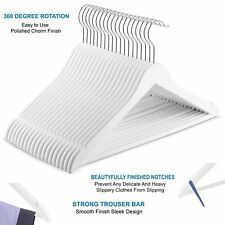 8 pcs Space Saver Wonder Magic Clothes Hanger Rack Clothing Hook Organizer Set WhiteColor: White100% brand new and high qualityMaterial:High quality plastic Each hanger size:About 23.5cm x 2.5cm(LxW) Wonder hanger 8 pack triples closet storage space by allowing you to hang up to five articles of clothing wrinkle-free on a single hanger.The easy on and off design allows each hanger to rest on a closet rod horizontally or drop down vertically to maximize storage and free up space.Ideal for apartments, dorms and older houses with limited closet space,can also organize clothes, belts, purses and accessories too. Package included8 x Magic Clothes Hangers(Without Packing Box)Note: Light shooting and different displays may cause the color of the item in the picture. 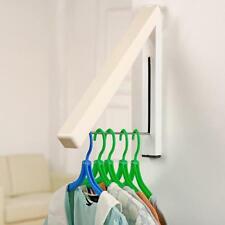 8 Pcs Wonder Hanger Space Saver. 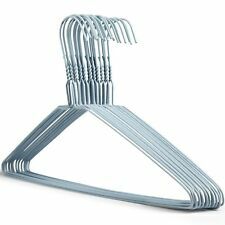 Item Type: Magical Hanger. The easy on and off design allows each hanger to rest on a closet rod horizontally or drop down vertically to maximize storage and free up space. Manufactured For Hangerworld. Trust The Hanger Experts! Tough, smooth, non-marking white finish. Rounded smooth hook end. Size: Width 41cm (16") approx. Works with any type of hanger. Triples closet space. 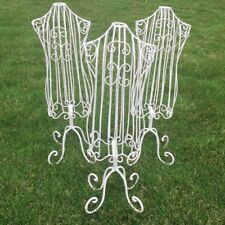 Great for seasonal storage. Easy on & off open design. GREAT QUALITY ITEM. 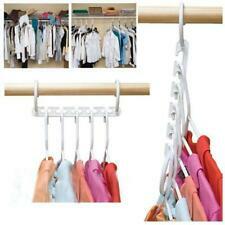 6 x Wardrobe clothes space saver hangers. 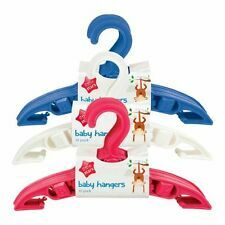 Each space saver hanger can hold 5 standard hangers. 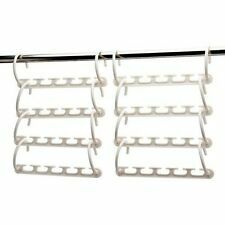 Item Type:Cloth Hangers. 1 x Pet Hanger. Suit for small size dogs. Due to the light and screen setting difference, the color of the item may be slightly different from the pictures. All pictures are for illustration purpose only and Colours may vary slightly. Material: Stainless Steel. Rate (item arrived). Canada Rate (item arrived) 0.0% 47.1% 31.4% 17.6% 3.9%. Material: Plastic. Size Approx Rate (item arrived). Canada Rate (item arrived) 0.0% 47.1% 31.4% 17.6% 3.9%. Manufactured for Hangerworld. Trust the Hanger Experts. Rounded Smooth Hook End. Tough, Smooth, Non-Marking White Finish. Quality 13 Gauge As Used By Quality Dry Cleaners.